THIS summer the city’s Department of Transportation inaugurates a new bike-share program. People who live and work in New York will be able to travel quickly and cheaply between many neighborhoods. This is major. It will make New Yorkers rethink their city and rewrite the mental maps we use to decide what is convenient, what is possible. Parks, restaurants and friends who once seemed beyond plausible commuting distance on public transportation will seem a lot closer. The possibilities aren’t limitless, but the change will be pretty impressive. I’ve used a bike to get around New York for decades. There’s an exhilaration you get from self-propelled transportation — skateboarding, in-line skating and walking as well as biking; New York has good public transportation, but you just don’t get the kind of rush I’m talking about on a bus or subway train. I got hooked on biking because it’s a pleasure, not because biking lowers my carbon footprint, improves my health or brings me into contact with different parts of the city and new adventures. But it does all these things, too — and sometimes makes us a little self-satisfied for it; still, the reward is emotional gratification, which trumps reason, as it often does. More than 200 cities around the world have bike-share programs. We’re not the first, but ours will be one of the largest systems. The program will start with 420 stations spread through the lower half of Manhattan, Long Island City and much of western Brooklyn; eventually more than 10,000 bikes will be available. It will cost just under $10 for a day’s rental. The charge includes unlimited rides during a 24-hour period, as long as each ride is under 30 minutes. So, for example, I could ride from Chelsea to the Lower East Side, from there to food shopping, later to the Brooklyn Academy of Music, and after that, home. This system is not geared for leisurely rides up to the George Washington Bridge or to Coney Island. This is for getting around. I’ve used bike-sharing programs in London, Ottawa, Washington, Toronto, Barcelona, Milan and Paris. In London, where they introduced a public bike program two years ago, I could enjoy a night out without having to worry about catching the last tube home or finding a no longer readily available black cab. In Paris, the Vélib program has more than 20,000 bikes and extends all the way to the city’s borders. Significantly, the banlieues, the low-income housing projects that surround that city, aren’t included, so the system reinforces a kind of economic discrimination, but maybe more coverage is coming. New York’s program will have some advantages over the Paris and London programs. New York’s high-rise housing projects are scattered throughout the city, so neither they nor their inhabitants will be excluded from the covered bike-share program area. The ugly tendency to segregate by race and class will be, in a small way, mitigated here. By bikes! PROTECTED bike lanes in Berlin, Amsterdam, Copenhagen and Vancouver signal increasing acceptance of bikes as a modern transportation alternative and increasing interest in bike safety. Some of these cities even have stoplights for cyclists, most of whom actually stop. European bikers take traffic rules seriously: passers-by yelled at me once when I stood in a bike lane, as New Yorkers often do, and chatted with a friend. I just completed a Latin American tour, not a music tour, but a series of discussions about bikes and transport; there it seems every city has its own bike-share program, many with peculiar local traits. Bogotá, Colombia, for example, has ciclovías, when the main streets are closed to all traffic except cyclists on weekends. Though Gabriel García Márquez reportedly had to lobby his community for approval for a bike path that was to go through his neighborhood in Bogotá, today those citizens are completely sold on biking as a way of getting around; Bogotá bike use has increased by a factor of five. Significantly, the increased biking has affected the city’s economy, as Bogotá recently extended a network of bicycle paths through lower-income neighborhoods around the city’s periphery, making it easier and more affordable for those who don’t live in affluent areas to get to work. Bike paths = jobs. In Paris, Montreal and Washington — other cities with systems that work the same basic way — I could use bikes to get to work or meetings, run errands and get pretty much wherever I wanted to go. Often, I arrived at destinations more quickly than friends who took cabs or the subway. At home, it’s gotten easier and safer to ride in the last few years. The city has added 280 miles of bike lanes and paths since 2007; if you stick to the paths, biking is less scary here than in London and Paris. I wouldn’t advise a novice to ride down Canal Street or (God forbid!) on Flatbush Avenue, because there are lots of lanes of different kinds of traffic there and no protected area for bikers. I try to stop at red lights and often feel lame when other cyclists zoom by. But if this system is ever going to be safe enough for kids, stopping for lights and following traffic rules is something we all have to do. I was ticketed twice here in New York for running a red light; I got the second ticket while riding downtown to argue the first one! After getting my groceries I tossed the bag in my basket (yes, very geeky, I know) and rode home up 10th Avenue. If I had wanted a safer, quieter ride, I could have gone over to the Hudson River bike path, which I use to commute to work in SoHo. The ride along the water is gorgeous and relaxing. Compare the feel of pedaling along the riverside to the clenched-jaw, stressed-out feel people have when they drive to work, get stuck in traffic, pay a fortune for parking or circle around looking for impossible-to-find street parking. Just saying. I realized that bike travel had practical value a long time ago, when I was a kid, in Baltimore. I lived in Arbutus, which is on the outskirts, near the city line. There was public transportation, a bus line, but it was designed mostly to get people into the central city. It was useful for an occasional urban gawking adventure, but it was useless if I wanted to visit my friends. So I rode a bike to get to the nearby neighborhoods where they lived and where my high school was. When I finished college, I wanted to live in the city, where the excitement was. Like a lot of other young people, I arrived in the city with no money and lived in glorious squalor; we spent most of our full, busy lives in bookshops, bars, tiny apartments and cheap ethnic restaurants. It was exciting and productive, but it wasn’t easy, and eventually we wanted life to be less of a constant struggle. We saw that people in other urban centers, especially in Europe, were finding ways to live with their cities rather than in spite of them. How could we do that? Questions like this aren’t uncommon and spring from a sense that one’s life might be rewarding in ways that don’t have to do with material success, status or making money. Quality of life — cliché though it has become — eventually became a big consideration for a lot of people, not just artists and immigrants, but also businesspeople, designers, office workers and code writers, who came to the city and wanted to stay. They want to raise children here and live a vibrant, exciting life as they grow old. I just turned 60 and have no plans to retire to the suburbs. I love it here. 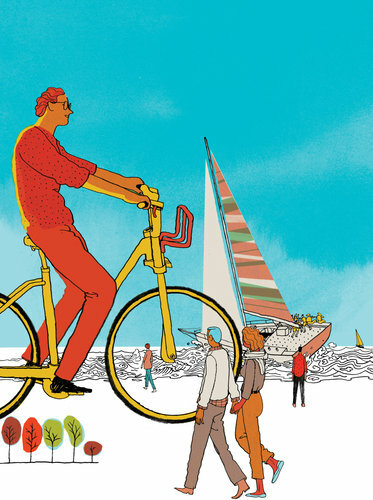 For me, and lots of other people, the answer to the question “What would improve the quality of our urban life?” involves simple things like ... um ... bicycles, which make getting around — and being in — the city easier, more pleasant and more affordable. New York is one of many cities that are creating all kinds of new green spaces, riverside parks and bike programs, all of which are symptomatic of our desire to make our cities into our homes. David Byrne is an artist and musician.